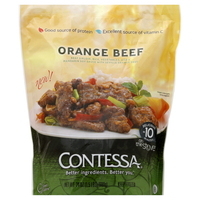 For the last month or so, Grocery Outlet has been carrying three of Contessa’s frozen “On the Stove” meals ($4), out of the 20 or so that Contessa makes: Orange Beef, Crispy Pork with Tangerine Sauce and Crispy Chicken with General Tsao Sauce. I’ve finally tried them all and while I really like the Orange Beef, the other two are not nearly as good. These meals consist of a package with four different components: a bag of white rice, a small bag of meat, another bag of sauce, and frozen vegetables . To prepare, you stir fry the meat for 5 minutes or so, add the veggies for another 3-4 minutes and then the sauce for 30 seconds. You microwave the rice for 3 minutes, put it all altogether and you are done. Note that there is too much rice for the amount of meat/vegetables/sauce included – I ended up discarding about 1/3 of it. One package is supposed to have two and a half 1-cup servings. Now, if you are a child or on your deathbed maybe 1 cup of food (mostly rice) may satisfy your hunger. Personally, I’d say it serves one adult – maybe you could share it with a younger child, but not more. Now, as for the food itself. The meats were generally good, tasty and tender, and they brown nicely. The rice is as what you could expect from something that comes from a bag. The sauces were generally good; I particularly liked the orange sauce that came with the beef, it was dark and intense and not overly sweet. The General Tsao sauce was a bit too spicy for me, but it was still pretty good. Where the problems come are with the vegetables. The orange beef came with onions, leeks and red peppers and these were all very nice, they kept their flavor and went well with the sauce. The tangerine pork, OTOH, came with onions, water chestnuts, carrots and scallions and these were less than tasty. I actually disliked the bell peppers, carrots and water chestnuts that came with the chicken, they had such an “off” taste that I couldn’t make myself eat them. In all, I’d say that the orange beef is restaurant quality (well, Chinese restaurant quality) and I would definitely buy it again (and have). I wouldn’t say the same about the other two meals. If GO offered other flavors, I would probably try them as well. I hadn’t been able to figure out how much these meals sell in regular supermarkets – perhaps they don’t have much distribution yet -, but I definitely wouldn’t pay more than $4. Today I took my daughter to lunch at her favorite chain restaurant, Panda Express (783 A Street, one of *three* locations in Hayward). It was much better than I expected. For $5.50 you get your choice of fried rice or a simple chow mein, and any two of about a dozen entrees. All the meat is tender and seems to be of decent quality. I didn’t try the fried rice, but the chow mein has “wok hei” – the smoky aftertaste of a properly made stir-fry. The orange chicken (my daughter’s favorite) was tangy and not over-sweet; the crust was not mushy at all. The sweet and sour pork is – well, inoffensive. I had broccoli beef and black pepper chicken. The broccoli was cut a little too large to be convenient to eat. It would have been more manageable either cut smaller or cooked a little longer. Mind you, it was delicious. The pepper chicken was aromatic with black pepper, but not hot, and strewn with slivers of onion and green pepper. Very little of the food is prefab; we were able to see a huge glass-fronted refrigerator filled with trays of raw vegetables. There are banners hung from the ceiling proclaiming “Gourmet Chinese Food.” I wouldn’t go that far, but Panda Express presses most of the Chinese-American-cooking joy buttons.